Carpet tiles were invented as an alternative to standard broadloom carpet. They are usually used for commercial purposes. They are usually standard in schools, airports, office buildings, and hospitality. There are several things to consider when trying to choose between broadloom carpet or carpet tiles. Keep reading for a list of things you need to know. Carpet tiles come in a wide variety of different colors and styles. They are available in numerous fiber types, many sizes, different pile styles, and manufactured and adhesive types. It means that it is way more likely to find a carpet tile equivalent to the roll of carpet you were considering or would have otherwise used in your home. Carpet is known for having very durable backing. The backing material options include: vinyl, fiberglass, vinyl/fiberglass, woven, urethane, polypropylene, recycled vinyl, and a few more. More important than the type of backing is the manufacturer’s warranty, which will protect the investment against shrinking, curling, and buckling. When this happens to the tiles, it not only looks bad, but may also lead to a safety hazard because it is open to have someone trip or fall. 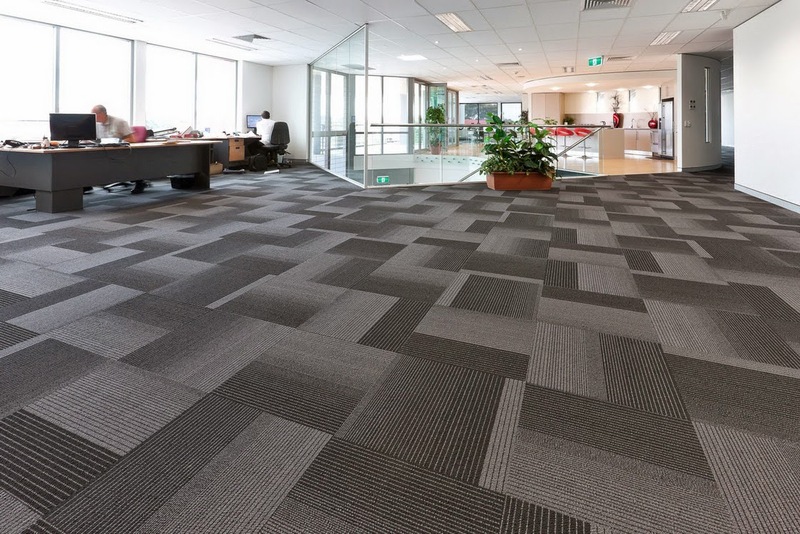 When choosing carpet tiles for your business, beyond considering the color and style, it is important to remember the big picture. You may be sold by looking at one tile, but envisioning the floor as a whole will help keep the finished floor from looking like a crazy pattern. If you plan on using tiles to create a pattern, envisioning the entire floor will ensure the pattern comes out the way you intended. It is also important to consider the sizes of the tiles, as they are available in multiple options. The tile size will impact the overall look of the finished floor. • Easier installation than standard rolled carpet. Do-it-yourself kits are available. These kits make it simple with instructions, and even measuring the tiles for the installation. • Easier cleaning and care. The tiles do not require any padding or glue to install them. Individual carpet tiles can be removed for cleaning, and replaced when dry. If one area of the floor becomes damaged, the tile can be replaced without replacing the entire floor. • Carpet tiles allow for freedom with design, allowing you to give more depth and texture to a room. • The seams of the carpet tiles are more easily seen when compared to wall-to-wall carpet rolls. Without careful installation, the seams could appear uneven. • Carpet tiles are less durable to wall-to-wall carpet, meaning they will wear down faster. When used in high traffic areas, they are more likely to come up at the edges. • Like their carpet roll counterpart, they are not ideal for areas subject to moisture where mold and mildew may become an issue. The sub-floor needs to be clean and even for the best possible installation result. • Carpet tiles are generally more expensive than carpet rolls. With this information in mind, you will be able to make the best decision for your budget and particular situation.